Experience the benefits of subconscious wellbeing and it’s contribution to inner beauty and happiness. Greater inner peace and contentment, emotional vitality, self acceptance and self love heals the soul and allows an even more gorgeous you to shine through! What’s unique about gorgeous is that it is an approach that recognises happiness is a personal thing. There is no one recipe or picture that suits everyone. It has to do with being true to your self. Gorgeous is about not ending up stressed out, frazzled and cynical. And to avoid this you need to know who the true you is. You might be pleasantly surprised by what you find! Call Michela now to discover how gorgeous you can be! Gorgeous doesn’t preach the do’s and don’ts of life. What it does do is offer the tools for increasing awareness about the kind of choices that generate positive consequences and shows the powerful relationship between the mind, happiness and wellbeing. Going gorgeous is about finding the right balance for you to feel fulfilled, happy, vital and productive. The mind can be an incredibly positive force in our lives or it can be very destructive generating stress, poor health, relationship conflict and unhappiness. The key is to understand, listen to and build a positive and powerful relationship with your Higher Mind. Not sure what your higher mind is? Well if you don’t know what it is or how to utilise it then you are missing out on the most powerful aspect of your Mindset. To experience fulfilling success this is essential knowledge. With Gorgeous, Michela shares the insights and knowledge of over 28 years experience as a practitioner and teacher. Information and skills that have helped thousands of women change their lives for the better and quickly! Her strategies work! And she’s not here to give you the answers. Her passion lies in empowering you and your relationship with your Mind to listen and act on the answers already within you. Go Gorgeous™ is a wonderful and inspiring approach for big hearted women, created by Michela F. D’Addario, that addresses the keys to shining more brightly and gorgeously in your personal and professional world. We provide consultations, workshops and a network designed specifically for women to support vibrancy, self love and happiness…the essence of being gorgeous. Identify the language of depression, anxiety and unhappiness and discover how to stop thinking, feeling and speaking it. Many successful women don’t necessarily identify as being depressed or anxious, but there’s just a constant niggling sense of dissatisfaction or disappointment with ourselves. And this is often regardless of our achievements. Learn how to stop being a slave to the false beliefs and distorted emotions, that tell you who you are, or what you are doing, is not good enough. Discover the beauty of who you really are. Maybe you recognise your past is holding you back from loving yourself and truly living a good life. Maybe your heart was broken by life and now you are ready to remove the armour and allow your Soul and emotional self to heal. With Go Gorgeous you will discover the true meaning of soul care, self acceptance and emotional and physical vitality. Learn how to embrace, heal, honour and celebrate the gorgeous woman inside you. A shining heart is your birthright. Successful women are often not good at self care. In fact Michela has found this is the one area of our life we can be hopeless at! Michela has had the personal experience of living with this blind spot and seeing also the consequences for women who have done the same. Let’s ensure we are successful not success fools! Self care is a key to work life balance, fulfilment and wellness and Michela shows women how, through her own personal and professional discoveries. Fundamentally the Very Fast Train of Perfect Success comes at a huge cost. 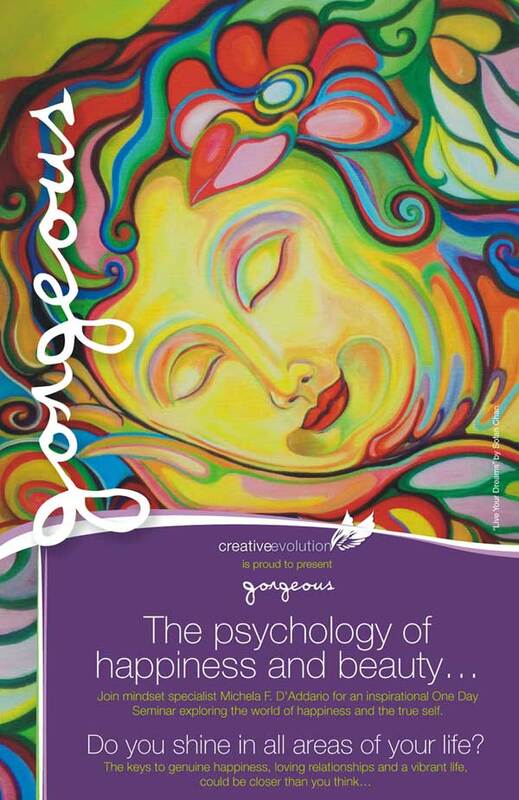 Gorgeous is about painting a picture of a holistic life of excellence and balance and then learning how to live it. A Gorgeous Mind ensures you stay successfully and happily in the driver’s seat of your life! No matter how much we want positive change in our lives, sometimes the reality of it can be a little frightening. It means accepting that some aspect of our life is not working as well as it could be and that can be disappointing or threatening to accept. Why is that we don’t do what we know is good for us? The answer lies within your subconscious. Self Care is often overlooked by women because we lack self love and self acceptance. We drive ourselves mercilessly because of one core limiting negative belief: ‘I am not good enough’. Go Gorgeous consultations create a safe, confidential and empowering environment where you can gain awareness and discover that we all have areas of concern in our lives and that doesn’t mean we have failed. It simply shows you where there is a weakness in your Mindset. The area of concern ironically often becomes the greatest triumph in your life! A mistake only becomes a failure when we fail to gain the positive learning on offer. Enjoy the experience of overcoming your internal obstacles and releasing the emotional baggage you have collected through life, thereby strengthening your Mindset for happiness and success. By liberating your self, you liberate others in your world. It trully is a win-win. There is a mistaken perception amongst many successful women that self care reflects weakness and is boring and puritanical. Let alone impossible to do in a time poor life. And yet high functioners then wonder why with their great job, they don’t have the relationship they want in their life; or why they’re always tired, or feeling depressed or unhappy. Or finding that the great family, career or business isn’t enough or is too much. Will the real Ms Gorgeous please stand up! Going Gorgeous is about ditching the superwoman cape along with the high stress and associated negative coping strategies and finding a balance by discovering what one’s true needs and wants are. Words like should, can’t, must, have to, are the language of unhappiness, imbalance and depression. Do you know what truly makes you genuinely happy? Do you know what your core needs are and how to create work life balance so you can meet them? Would you like to get to know the ‘gorgeous you’ better? Are you aware of the absolute beauty of your true self? It’s time to give your Self permission to SHINE! See Success Stories for testimonials regarding individual client work. I wish to invite you to attend our Go Gorgeous Workshop on August 15th at The Langham, South Bank. Wonderful women like you are the inspiration for making this event a reality. Aside from the insights and learnings that will be shared, what is particularly special about this day is that you’ll be in the presence of other gorgeous women intent on evolving and shining brightly. And that creates powerful energy. Come on your own, invite some of your favourite women to join you in sharing the magic, or make it a fabulous team-building day with a difference! However it plays, I am certain you will make more special friends before the end of the event and enjoy the many benefits of being part of the Go Gorgeous network. I have chosen Melbourne to hold the first Go Gorgeous Workshop as it has always held a very special place in my heart and for my mother as a young woman in the 1950’s. I wish this day to be truly amazing for us…life changing is how my seminars and workshops are often described. And we will certainly be doing self discovery in style, with the magnificent Langham Hotel being our backdrop as we discover how to weave more fulfilment and self care into our lives. Time is of the essence! Your support in assisting this event to touch the hearts of women, who would enjoy and be nurtured by Gorgeous, is much appreciated! Please pass information about the seminar onto the ten most important women in your life, who you know deserve to be part of this unique and heart warming event, and through your networks. 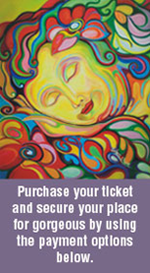 Invite women to come here at www.creativeevolution.com.au/gogorgeous for more information and to book online. And do not hesitate to contact me personally on 0410 930 804 if you have questions about the day. If you would like to be a sponsor of our Gorgeous Event, I would also love to hear from you. So seize the opportunity, act now, and be a part of what we are certain will be one of the most special events you will experience this year! As we know sometimes the best experiences happen with a spontaneous decision. Rarely, as high functioning women, do we give ourselves a whole day, just for us. Join Gorgeous Women in celebrating our unique beauty and the keys to living more fully in the truth of who we are. If you’d like more information or to register for our upcoming Go Gorgeous Workshop, please contact Lyndal on 0400 867 883. No matter how much we want positive change in our lives, sometimes the reality of it can be a little frightening. It means accepting that some aspect of our life is not working as well as it could be and that can be disappointing or threatening to accept. Go Gorgeous Workshops create a safe, confidential, fun and nurturing environment where we as women can gain awareness and discover that we all have areas of concern in our lives and that doesn’t mean we have failed. It simply shows us where there is a weakness in our Mindset. The area of concern ironically often becomes the greatest triumph in our life! Enjoy the experience of overcoming your internal obstacles and strengthening your Mindset for happiness and success. By liberating your self, you liberate others in your world. It trully is a win-win. Every Go Gorgeous Workshop, whilst covering some core concepts, is tailored to the needs and energies of each specific group. Michela facilitates intuitively to ensure you will receive the ‘aha moments’ you need to progress in your healing and growth. And with over 30 years experience, and with thousands of women having experienced her workshops, you can be assured of a safe and nurturing environment. Do you shine in all areas of your life? You’ll discover the keys for an even more gorgeous you to shine through. Did you know happiness is a skill that can be learned, practised and improved? Or that abundance is a natural progression for people in harmony with their true selves? Learn how to embrace life excellence and effectively put a stop to perfectionism and the ‘superwoman syndrome’ that takes us further away from, not closer to, happiness. Discover the fascinating contribution of the subconscious to beauty, wellbeing and happiness – it’s amazing stuff! How self care leads to self awareness and a more powerful positive impact in the world. Learn how happiness and success are not the same and what you can do to create your personal “True North” life map for happiness and health. This can be your awakening to the self discovery of the beauty of your higher mind and heart, and it’s role in creating a life you can truly enjoy on all levels. But these things don’t fall out of the sky – you need to act to start the process of healing for happiness! Please contact us directly on 0410 930 804 if you have any specific questions. When you book your ticket, a registration and information form will be emailed to you, for you to complete and return to michela@creativeevolution.com.au within 3 days of purchasing your ticket. If you require further information please email us at michela@creativeevolution.com.au or call Lyndal. So go gorgeous and act now to experience self discovery and shine! If you’d like Gorgeous to come to your city then please contact us. Details of the beautiful Melbourne Workshop held at The Langham in past years are below for you to get an idea of what we can cover in a gorgeous day…. We are truly pleased to be able to present such a new and innovative workshop in splendid surroundings such as The Langham. We’ll be able to cover a range of subject areas and to provide personal attention. And we know that what you will be receiving in this one day will assist you for years to come. A National Go Gorgeous Seminar will occur within the next 12-24 months. * For those of you travelling interstate, or participants wishing to enjoy the luxury of the Langham over the weekend, once you register you will be provided with a special code for a significantly reduced rate on accommodation. The colourful painting featured in Gorgeous is ‘Live Your Dreams’ by Sofan Chan. See www.theartofhappiness.net for more about the artist and her beautiful work.